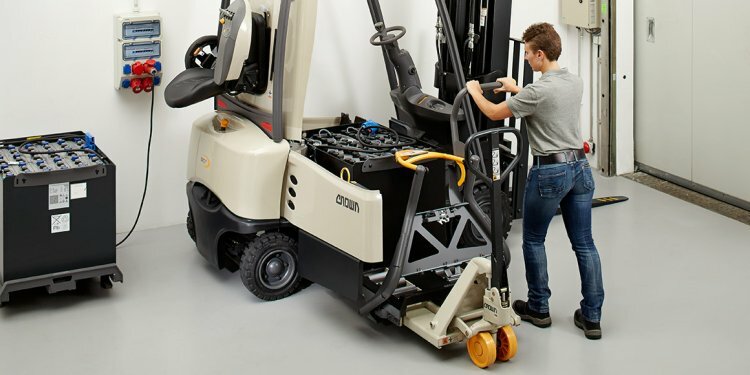 Operators of Crown SH/SHR Series find them easy to use – even in tight spaces – since the innovative controls and compact design enhance maneuverability. The pantograph reach mechanism of the SHR Series combines the advantages of a straddle stacker and a counterbalance forklift to handle a wide variety of pallet sizes. It can also be used with block stacked pallets where there is no space between loads for outriggers, allowing the operator to reach over obstacles, rather than reposition them. The exclusive Crown X10 Handle simplifies every lift truck function while the electronic power steering minimizes steering effort and reduces fatigue – even when navigating loads up to 4000 pounds with one hand. A brake override feature facilitates operation in extremely confined spaces with the handle in a nearly vertical position. The low-profile power unit, clear mast design – with nested rails and the efficient routing of hydraulic hoses – all contribute to clear visibility so operators can move loads quickly and confidently even while working with elevated loads.